• Objective. 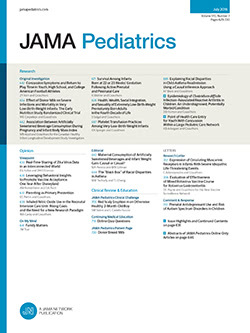 —We explored whether communication from pediatrician to parent to child might assist in education about and prevention of human immunodeficiency virus (HIV) infection by comparing parents of children aged 10 through 17 years who did discuss acquired immunodeficiency syndrome (AIDS) with their children with parents of children aged 10 through 17 years who did not discuss AIDS with their children. Research Design. —Secondary analyses of the National Health Interview Survey, a general population survey with items on AIDS. We compared the relative importance of various characteristics in distinguishing parents who did discuss AIDS from those who did not. Variables included whether the parents had received an informational brochure about AIDS from a health care provider. Results. —Twenty percent of respondents had at least one child between ages 10 and 17 years; 62% of these parents had discussed AIDS with their children. This percentage was greater for parents living in metropolitan statistical areas with fewer than 100000 persons compared with parents living in larger cities (73.6% vs 62.7%). Seventy-four percent of women (n=4745) had spoken to their children about AIDS; only 49% of men (n=3271) had done so. This gender difference was present in both one- and two-parent households. Hispanics were significantly less likely than non-Hispanics to have discussed AIDS with their children (men, 38.9% vs 49.9%; women, 62.6% vs 74.2%). Gender by far was most strongly associated with talking to children about AIDS, followed by self-assessed knowledge, knowing someone infected with the HIV, and actual knowledge about HIV and AIDS. Parents who reported reading an AIDS-related brochure were significantly more likely to have spoken with their children than were parents who had not read such a brochure (76.2% vs 57.4%). Thirty-seven percent of parents receiving a brochure received one from a health care provider.